Three years ago, discussion of medical identity theft was limited to cybersecurity circles. Thanks in large part to high-profile data breaches at Target, Home Depot, the Office of Personnel Management and others, medical identity theft has since become everyone’s concern. 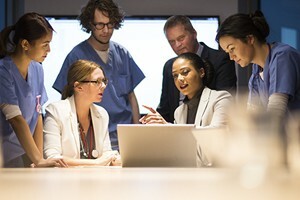 The digitization of medical records, which include every piece of medical information about the patient, has streamlined and improved care around the world, but has also opened up a high-value mark for cybercriminals. Unlike a stolen credit card, which can be quickly suspended and its charges reversed, medical history cannot be refunded or replaced. The implications of compromised medical identity are dire. Receiving a diagnosis for a disease you don’t have, prescription to medication you’re allergic to or inappropriate treatments are all possible if your medical records have been compromised. ID Experts, an innovative company that provides identity-monitoring solutions, began to develop a product to combat medical identity fraud. Despite the high need for medical identity protection, there was no existing market for such products. Without a clear strategy for bringing the product to market, further development seemed untenable and ID Experts was forced to shelve the idea. Bringing a product into an unfamiliar market is a challenge for any company, and creating a product for a nonexistent market often means risking capital on an uncertain venture — a risk many companies are understandably hesitant to take. Late in 2011, ID Experts president and co-founder Rick Kam asked Bluewater International to look at what would become MIDAS™ – Medical Identity Alert System. Recognizing the significant need for a medical identity fraud product, Bluewater refined how MIDAS™ would address the issue, oversaw product development and go-to-market strategies and came along side ID Experts’ executive team as the company entered the next level of growth. With extensive experience in data security, Bluewater analyzed what had been done in financial identity fraud and applied those lessons to building a product that would track medical claims and proactively counteract medical identity fraud. Working in conjunction with the CEO, Bluewater created an advisory board made up of the Bluewater team, executives at ID Experts and other industry experts, to guide MIDAS™ into the market, strategize how the platform would deal with security and privacy, addressed legal and regulatory issues, and strategized how to deal with consumer relationships. Rather than drain resources through high retainers, Bluewater accepts a stake in the company as primary compensation, which means that Bluewater’s payoff is proportional to the company’s success. Working alongside the ID Experts executive team, Bluewater nurtured relationships with some of the largest health insurance organizations in the U.S., representing MIDAS™ as the most advanced medical identity-monitoring platform on the market. In January 2016, Anthem BlueCross BlueShield Venture Program and Sandbox Advantage Fund awarded $5 million to ID Experts in a series A investment round for the MIDAS™ platform.